Thomas said, ” Except I shall see in his hands the print of the nails, and put my finger into the print of the nails, and thrust my hand into his side, I will not believe” (John 20:25). 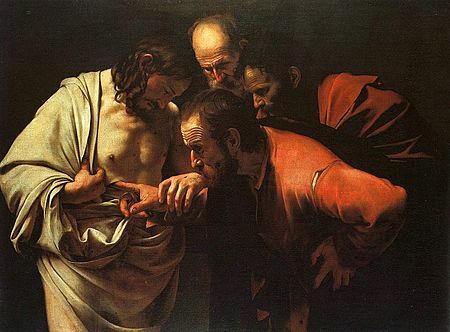 Thomas is often called “Doubting Thomas” as if the need for proof is a fault. Verification and proof is not a fault, it’s just the result of an analytical mind that is curious to a fault, and in today’s world that is not a bad quality to possess. After all it’s not every day that someone rises from the dead, and real authentic miracles are rare just by virtue of the fact that they rarely occur. God does however intervene in our world from time to time in powerful ways. That is not to say of course that He is not involved, or uninterested, it is just that most of the time it seems that He allows nature to take its course. Be careful for nothing; but in every thing by prayer and supplication with thanksgiving let your requests be made known unto God. And the peace of God, which passeth all understanding, shall keep your hearts and minds through Christ Jesus (Philippians 4:6-7). Truly it is a comfort knowing that we are invited by the very same God who created the universe to bring our needs to Him in prayer. We are also told that we can, through prayer, cast all of our cares upon Him, because He really does care for us (1 Peter 5:7). But have you considered that if Christ did not rise from the dead all of that would be in vain? Paul even tells us that if Christ was not really raised from the dead then those who believe in such a Christ, a dead Christ, are of all of the people of the Earth, the most miserable; because they believe in a dead savior who cannot help them, and a dead savior who cannot answer their prayers, because he is dead and remains so. For if the dead rise not, then is not Christ raised: And if Christ be not raised, your faith is vain; ye are yet in your sins…If in this life only we have hope in Christ, we are of all men most miserable (1 Cor. 15: 16-17,19). But Thomas, one of the twelve, called Didymus, was not with them when Jesus came. The other disciples therefore said unto him, We have seen the Lord. But he said unto them, Except I shall see in his hands the print of the nails, and put my finger into the print of the nails, and thrust my hand into his side, I will not believe. And after eight days again his disciples were within, and Thomas with them: then came Jesus, the doors being shut, and stood in the midst, and said, Peace be unto you. Then saith he to Thomas, Reach hither thy finger, and behold my hands; and reach hither thy hand, and thrust it into my side: and be not faithless, but believing. And Thomas answered and said unto him, My Lord and my God (John 20: 24-28). Once Thomas saw the Lord Jesus he didn’t need to put his finger into the print of the nails, and he didn’t need to thrust his hand into his side. Thomas did what any of us would do in that circumstance, he believed! Indeed, the sight of the living Christ so overwhelmed Thomas that he just cried out MY LORD, AND MY GOD! Truly, Thomas saw the risen Christ, and Thomas was also humbled before the living Lord and God of the universe, Jesus the promised one, the Risen Messiah! But what saith it? The word is nigh thee, even in thy mouth, and in thy heart: that is, the word of faith, which we preach; That if thou shalt confess with thy mouth the Lord Jesus, and shalt believe in thine heart that God hath raised him from the dead, thou shalt be saved. For with the heart man believeth unto righteousness; and with the mouth confession is made unto salvation (Romans 10:9-10). It is my prayer that you have been helped by the things I have written. My motivation is to see people brought to the Risen Savior so that they may come to eternal salvation through faith in Jesus Christ. I am also motivated to teach the truth about Bible prophecy and the coming Great Deception. My prayer is that the power of the Holy Spirit will use the things I have written to set people free from the strong delusion regarding UFOs, and aliens. Evil is becoming more powerful and aggressive in these last days, indeed, in the past year Christian persecution has become more aggressive and evil all around the world. In the United States the militant gay lobby is attacking Christian people and businesses. It is quite evident that the goal is to shut down economically anyone who disagrees with the homosexual lifestyle; so in essence anyone who lives out the Christian faith in the business world is a target. There is more to this evil agenda though, as the ultimate goal is to shutter every Bible believing church in America and to shut up every vocal Christian in the land. All of this is a very good example of the spirit of antichrist actively working in the world. We see the people: ISIS, abortionists, the militant gay lobby, and other antichristian groups. They are the face we see, but just remember, behind every antichristian act is a powerful unseen spiritual being using these deceived humans just like a puppet master who manipulates puppets on a string. On Resurrection Sunday pray for persecuted Christians suffering in Syria, Iraq, Iran, Indonesia, and all around the world. Pray for Christians who are being tortured and mutilated. Pray for Christians who are unjustly locked up in prisons, as they are lonely, hurting, and hungry. Pray also for persecuted Christians in the U.S. who are losing their businesses and jobs because of the unceasing attacks of the politically correct crowd in the militant gay lobby and the media. Thanks again for visiting, and thank you to everyone who is supporting this work by purchasing the Alien Antichrist book from Amazon and other fine bookstores.